From MegaHouse. Each 3' tall figure in this five-figure series comes with its own special base and a perch on which the figure can 'float' or 'fly'. 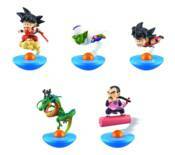 Collect two versions of Goku, plus Piccolo, Shenron, and Mercenary Tao! DRAGONBALL SUPER SON GOKOU FES!! SPECIAL VER. DRAGONBALL SUPER SON GOKOU FES!! SPECIAL VER. BROLY - DRAGON BALL SUPER MOVIE WCF VOL.1 CERTAIN MAGICAL INDEX III NENDOROID PLUS KEYCHAIN ASST. DRAGON BALL SUPER GOKU 01 PLUSH 6.5" DRAGON BALL SUPER GOKU SITTING POSE PLUSH 7"
DRAGON BALL SUPER SSG GOKU 01 PLUSH 5" DRAGON BALL SUPER SSGSS GOKU 01 PLUSH 6.5"